Pancetta di Calabria DOP is a salted and cured charcuterie product (bacon) obtained through the processing of meat from the lower part of the ribs of large-sized pig born and raised in the southern Italian region of Calabria. Pancetta di Calabria DOP is typically 3-5 cm thick and is characterized by its bold red colour, due to it being covered in chili powder. It has an intense aroma and a strong, spicy flavour. 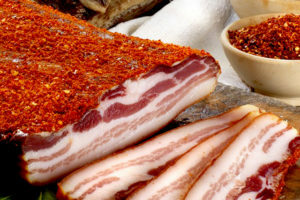 Pancetta di Calabria DOP can be eaten raw, with a slice of bread and is often used as an ingredient in regional recipes such as pasta all’ Amatriciana and Carbonara.